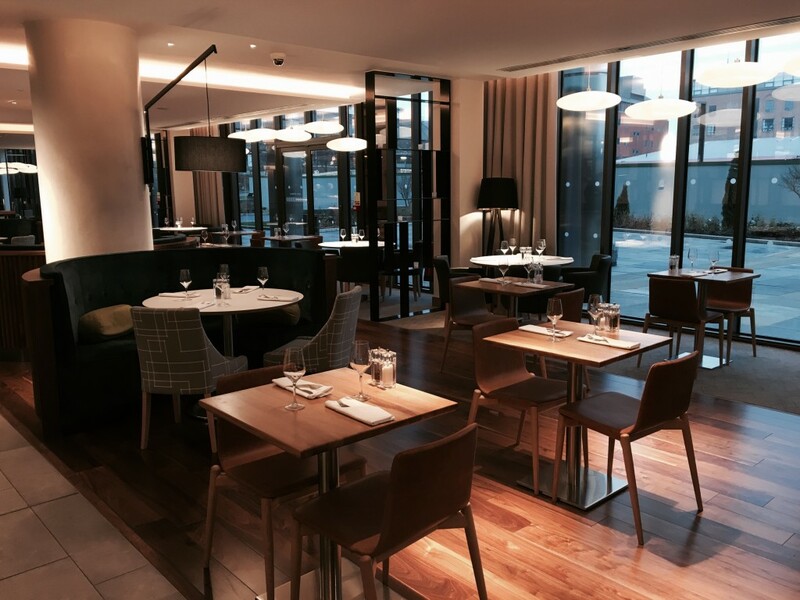 It seems like only 5 minutes ago that the very swish Crowne Plaza hotel opened its doors, but after 4 months of trading, we were invited to sample the culinary delights of Hawthorns, their signature restaurant/brasserie. We’d basically hidden in the house all weekend thanks to the random snowfall the day before and upon arrival at the restaurant, it appeared everyone else was still in hibernation. 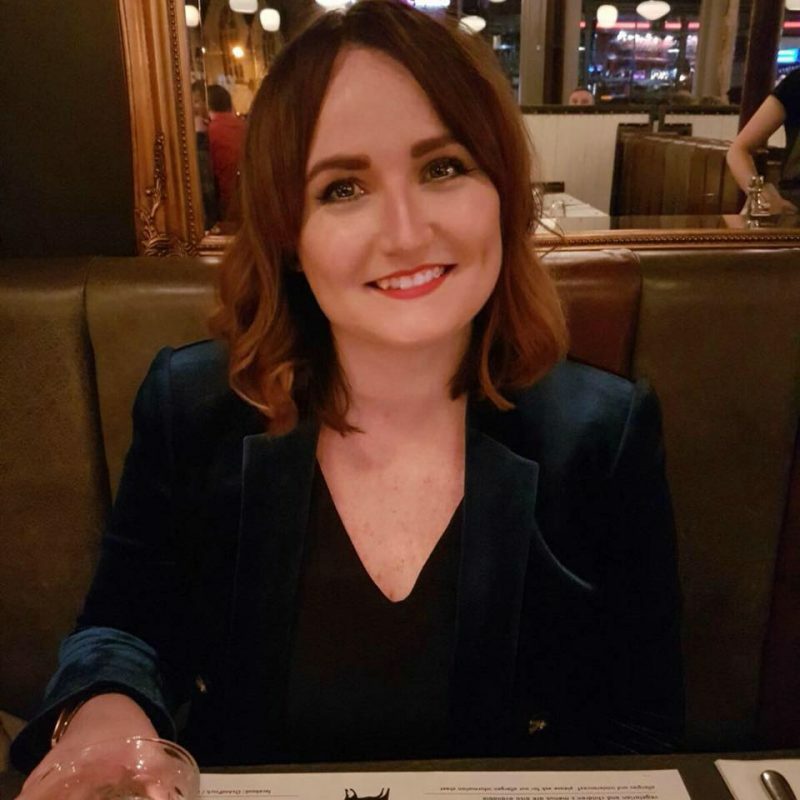 The VERY aesthetically-pleasing brasserie was completely empty, allowing us to take our pick of spots to sit and allowing me to take plenty of photographs of the gorgeous surroundings. I was assured by Jack, who looked after us during our visit, that the quietness was a one-off and largely thanks to the weather, but I can’t say we were complaining about having the place to ourselves! The Hawthorns menu is extensive, which made it pretty difficult to make our selections, so we were left deliberating for at least 20 minutes whilst enjoying a G&T, complete with The Gin Bar’s own gin and a Fever Tree Herbal tonic. I’ve had my fair share of tonic, but never this one, and it was bloody lovely. The very polite Jack popped by to check how we were getting on and answered any questions we had with the menu, and we finally settled on 3 starters to share (why not?!) and a main each. Their starters menu is a joy to behold, packed with locally-sourced seafood dishes like the Robsons of Craster smoked salmon (£9), meat treats like the Turnbull’s (a Scran fave!) of Alnwick Pork Pie (£8) and some delicious-sounding veggie options, so we figured we’d sample more to get the best view of their menu overall (or, we were just a bit greedy and couldn’t decide). 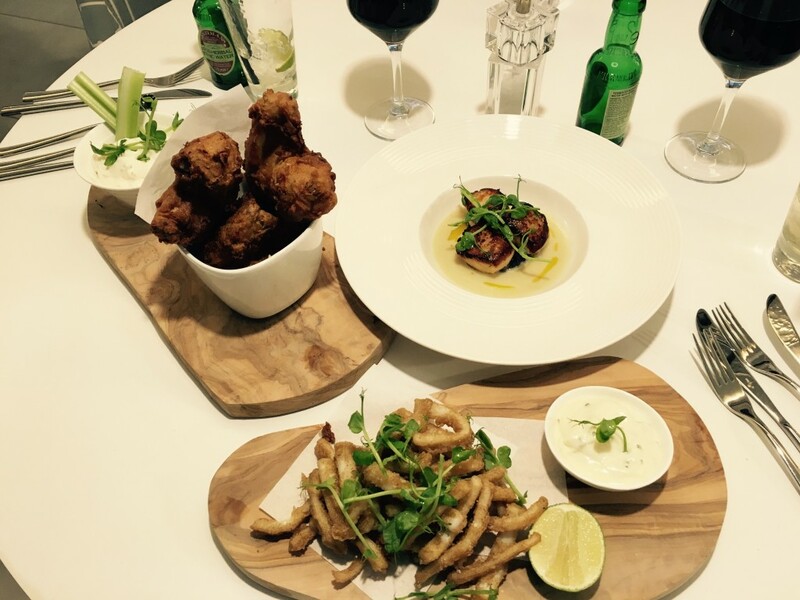 We opted for the Seared North Sea scallops (£10) served with herb-crushed heritage potatoes and Jerusalem artichoke velouté, the Flash-fried Salt and Pepper Squid (£7) and Cajun and Buttermilk chicken wings served with blue cheese dip and celery (£6). A delighful smorgasbord, I’m sure you’ll agree! 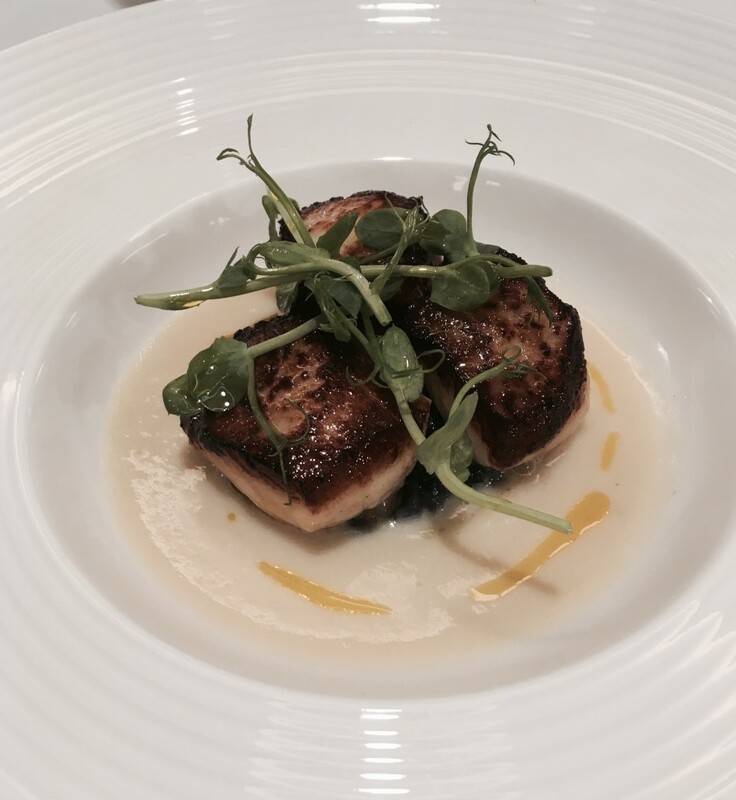 Each dish was beautifully presented and we couldn’t wait to tuck in, kicking off with the scallops. I’m super-picky when it comes to scallops (as any self-respecting foodie should be!) and I’m pleased to report that these ones were cooked to perfection and served piping hot. The herb-crushed potatoes gave a spot of colour to the plate and the velouté was a perfect, creamy accompaniment. Honestly, they were fantastic and I’d be sure to get them on my next visit to Hawthorns. By this point we’d already started diving into the Salt and Pepper Squid, which was packed with flavour but not quite as crispy as I’d hoped for due to a bit of excess oil. The lime aioli it was served with was fresh despite being luxuriously creamy and more importantly, there was plenty of it, so we could be quite lavish with the dipping. Always a winner in my book! The cajun and buttermilk wings were our wildcard choice and I was praying for old-style Southern fried chicken to round off our so-far very fishy starter feast. They didn’t disappoint and were so plentiful, with four chunky wings covered in flavour and accompanied by a (again, very generous!) helping of blue cheese dip and some celery sticks for extra dipping. A word of warning, they’re extremely messy, but so worth the messy fingers! At £6 and shared between two of us, these are fantastic value and a must-try for any Americana food lover. You’d think we’d be done eating, right? But no, I was given the duty of trying out the Hawthorns menu and I was damn-well going to fulfil it, so after a wait of around 10 minutes, it was time to attack the main course. Again, it wasn’t easy to choose, with yet more Turnbull’s meat on the menu (plenty of steaks to choose from, albeit pretty expensive at £29 for a fillet with sauce and sides still to purchase separately!) and locally-sourced fish, but after deciding I wanted this review to be about deliciousness at a surprisingly affordable price, I went for the Hawthorns Handmade Gourmet Burger (£14). 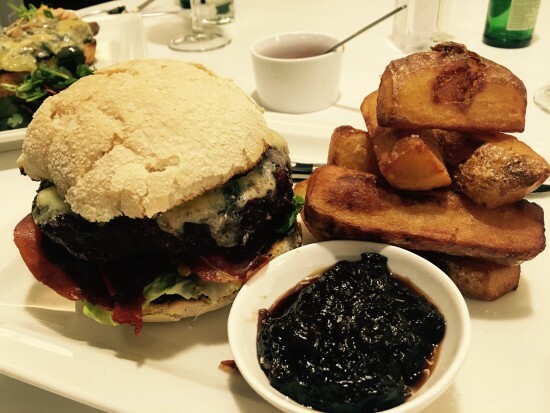 The burger was served in a Geordie Bakers bun, alongside very chunky twice-cooked skin on chips and an onion jam, and there was plenty of everything. 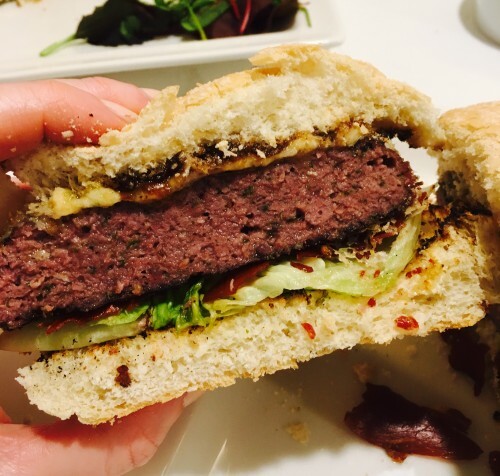 The burger itself was packed with cheddar cheese, prosciutto ham and baby gem lettuce and the patty was served pink. I have to say, the only disappointment with it was the bun, as it basically collapsed after about 3 minutes, but other than that it was very tasty and pretty reasonable when considering the taste to cost ratio. Additionally, the onion jam, which I’m assuming was made on-site, was tangy and very moreish – which I would have easily seen to with a cheese board if there was any room left in my long-suffering (ha!) stomach. Another successful course and all was washed down with a large glass of Mount Langi Girhan Shiraz (£7), and then another… whoops. 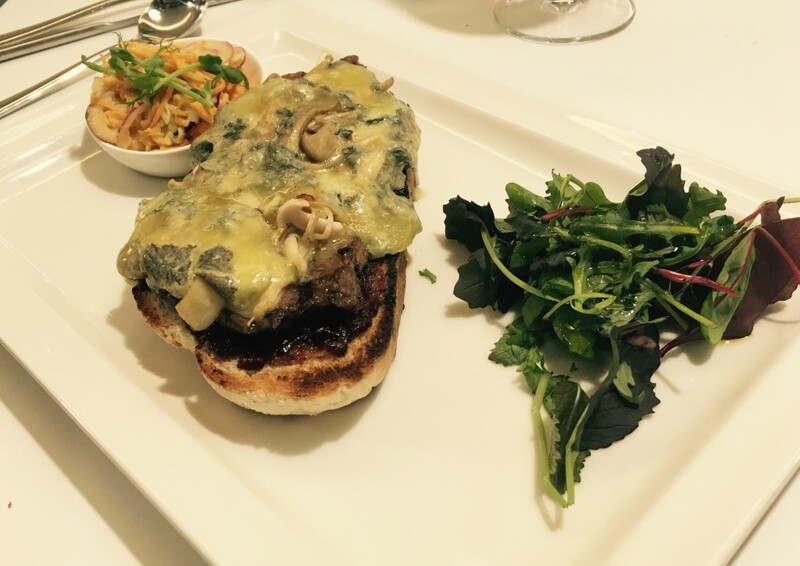 My boyfriend went for the One Minute Steak (£12.95), served sliced on toasted sourdough with melty Yorkshire blue cheese, wild mushrooms, red onion jam and (allegedly!) skin-on chips. The chips didn’t actually arrive due to a little confusion internally with the menu, but Jack saw to that swiftly and a couple of minutes later there were chips (although I can’t say we needed the extra carbs at this stage!). The steak was cooked to perfection and the sourdough remained crispy, despite the multitude of very fragrant blue cheese, and the wild mushrooms were a hit. Overall, the BF seemed to be enjoying it and valiantly polished off those pesky chips, despite being at bursting point. He’d chosen a couple of glasses of the French ‘La Serre’ Merlot (£5.60 for a large glass) to complement his main course, which I was told worked very well with the stinky but delicious cheese. There was absolutely no chance dessert was happening, so we retired to The Gin Bar to finish our wine and potentially go for one of their ‘Engineer Your Own’ martinis. Thanks to our visit taking place on a Sunday and with work the next day, we opted out of the martinis, however their extensive gin collection made it very difficult to turn down. I was also seriously digging their copper cocktail shakers on the bar. 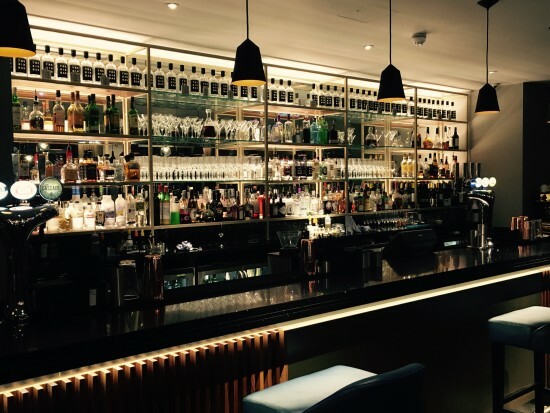 The Gin Bar is resplendent with luxurious furniture and mood lighting, complimented by DECENT lounge music and a floor to ceiling view of Sussex Street from their vast windows. Despite thinking there was absolutely no chance of anything sweet to round our Hawthorns experience off, Jack brought out a tray of Sweet Treats for each of us, featuring a toasted marshmallow, cherry and almond Florentine and a pistachio macaron. We’re such troopers and managed to finish these off and each little delight was perfection. If you, like us, feel that a full dessert would tip you over the edge but need something sweet, this will do the job and it’s only £4. One thing I really appreciated about Hawthorns was that, despite it being part of a large group of hotels, their menu is full of locally-sourced produce that supports our independent traders, like the aforementioned Turnbulls, Robsons and Geordie Bakers. So many hotels and even restaurants often favour cheaper, lower-quality wholesalers as opposed to businesses like the above, so it’s really great that they’re showing their quality credentials in this way. 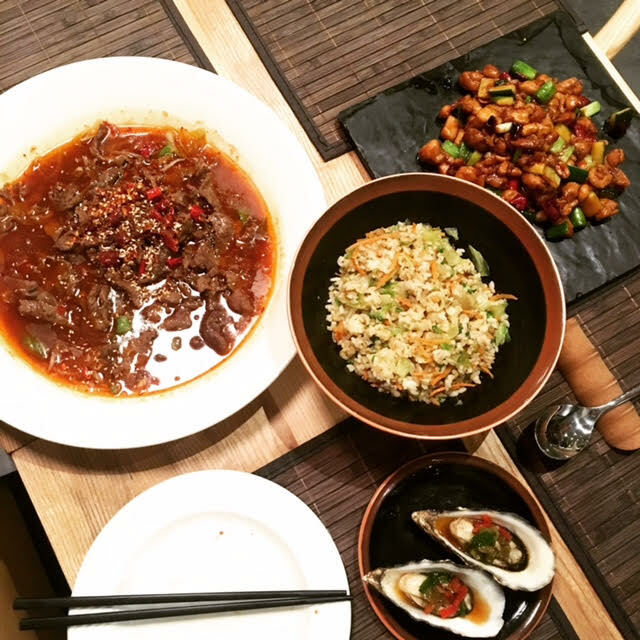 The only real negative I would say is their pricing structure – most of the things on the menu are pretty reasonable, but the price of the steaks sticks out like a sore thumb and isn’t consistent with their relatively good value menu overall. An extra £5* for a sauce, plus the price of a side (£4), takes the cost of a steak meal up to around £40, which is rather excessive if you’re just popping in for lunch or dinner. I’d say, if Hawthorns wants to entice the casual diner as well as catering for the hotel guests, this is one area to look at. The menu overall, however, is packed with choice and (as of next season!) will be seasonal, again favouring local produce and designing dishes that suit the time of year, as well as the location. Jack explained that, luckily, the kitchen team have been allowed free rein to cater to what their customers actually want as they discover more about them, so there’s a bit of flexibility and something that again, a lot of hotel restaurants governed by a chain don’t have. 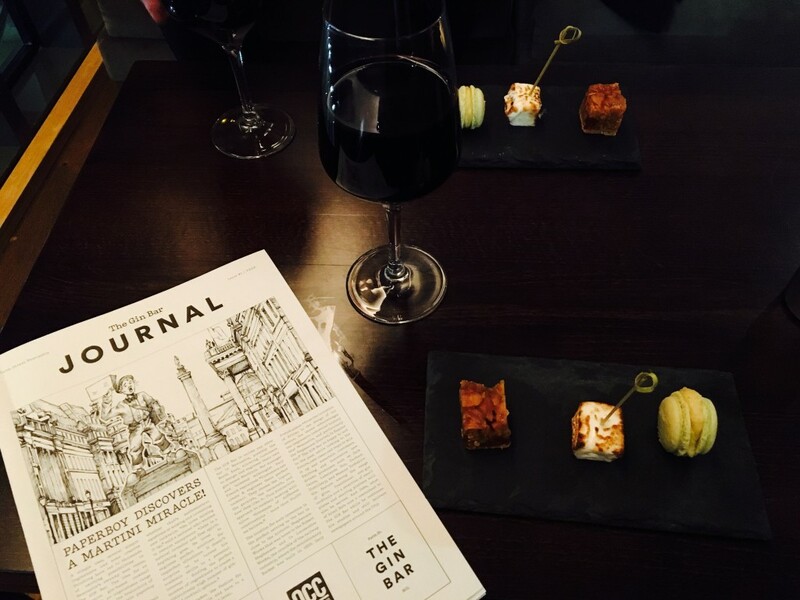 Sweet Treats and a glass of Shiraz while perusing The Journal – their cute take on a bar menu. The location and setting of Hawthorns is perfect and I expect that both the restaurant and The Gin Bar will grow in popularity over time. The beautifully designed building (and there’s a spa, which I’m dying to visit) is a serious contender to topple the likes of the Hilton/Malmaison from their spot in the favoured Newcastle hotel list, and I for one am already totally on board. Sure, there are a couple of things to iron out, but for a restaurant in its infancy, Hawthorns is already running circles around many of its high-end hotel chain competitors. 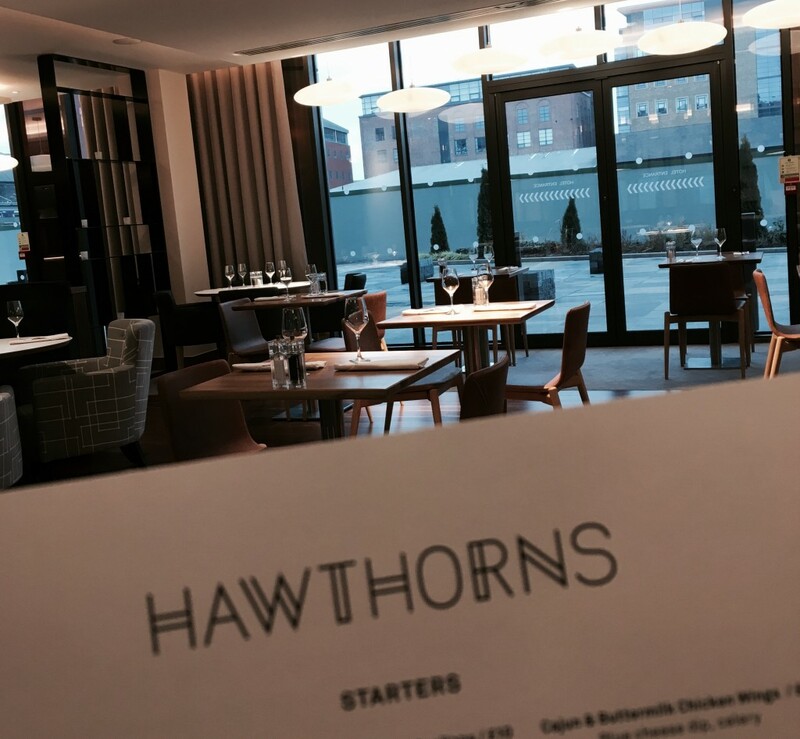 We had a fantastic lunch at Hawthorns and I’d seriously encourage anyone looking for somewhere different to head there for lunch or dinner. I’m also told that their breakfasts are pretty damn good, too, which is another review for another time – hopefully. Big thanks to Vanessa at MHW PR and Jack & the team at the hotel for the invitation and for looking after us so wonderfully. I already can’t wait to try next season’s menu! Food and drink were offered to us on a complimentary basis for the purpose of this review, however all views are true to experience and photographs are my own, taken on the day of the visit. 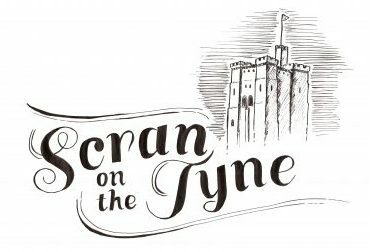 For any queries regarding the Scran on the Tyne sponsored post policy, email me at hello@scranonthetyne.com. *EDITOR’S NOTE, 15/02/16: I’ve been informed by the team at Hawthorns Brasserie that all sauces to go with steaks are now FREE, not the £5 quoted earlier in my review. Previous Post Christmas Dinner Meat from Great British Meat Co.
Oh my goodness, it’s a wonder you didn’t book a room for a lie down after ALL THE FOOD! haha! I love a Turnbull’s Burger and would also recommend. I would go as far as to say Hawthorns is definitely the best hotel restaurant in town. PS – The Scallops look HUGE!